Genet Semere’s entrepreneurial spirit has shown bright through years of real estate investing, the creation of a tax service in Richmond, a prior lounge/bar in Ethiopia, and now C’est le Vin. Originally hailing from Eritrea, Genet brings world-class flavor and vision to C’est le Vin, her cozy yet elegant Shockoe Bottom art and wine gallery, which opened in 2010. With wine always in her home and family, Genet paired her love for the vine with interests in art, performance, and music to create a truly unique atmosphere at C’est le Vin. There are regular art openings, wine tastings, poetry and jazz nights, book signings, even “a Glass and a Class” Argentinean tango every Wednesday night (beginners welcome, or just come enjoy the wine and be inspired by the music!). Add to that rich wines at affordable prices, deliciously prepared handcrafted tapas, entrees, soups, and salads … and you are in for a treat! 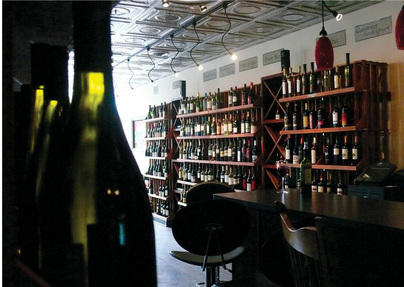 Amidst extensive global offerings, C’est le Vin features Argentinean, South African and Chilean wines and also carries many wines local to Virginia. Wine tastings are festive and the house wine is delicious! Perhaps what you feel most of all at C’est le Vin … is the welcome! The relaxed yet elegant ambiance sets the scene, but it’s the warm atmosphere that makes you feel right at home. The food and wine are predictably great, exchanges with others so natural. Genet says her vision was to create a “cozy, nice family kind of place. I just want people to feel comfortable and cozy … that is my dream!” And she has done just that.